The Law Office of Dan Price is a law office located in Palo Alto, California. Attorney Dan Price specializes in intellectual property law, small business law, dispute resolution, and employment law. 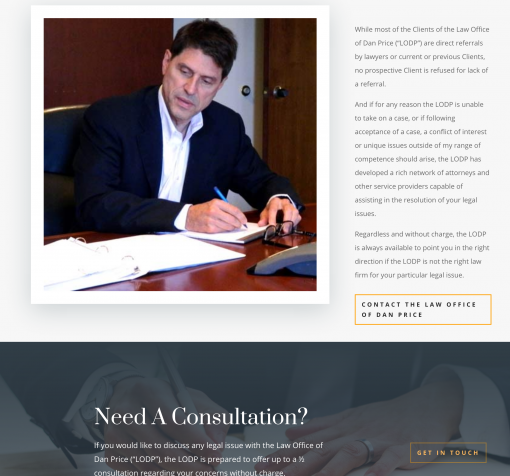 The original law office website was one I created a few years ago. It stood the test of time but wasn’t holding water for mobile optimization, SEO, or current design. I determined that the law firm website redesign could benefit from a makeover with a new Divi WordPress theme layout and updated content from the client. The website makeover also included local directory listing optimization to ensure all of the law firm’s online listings were synced and accurate.